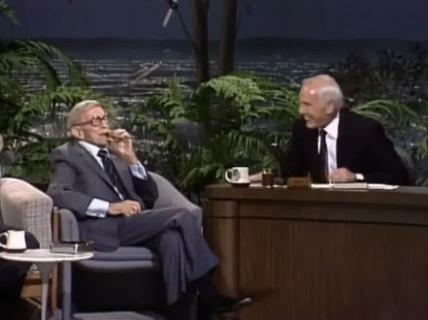 When George Burns was 93 years old in 1989 he was interviewed by Johnny Carson on his Tonight Show. In the interview Burns reminisced about the many entertainers that he knew and wrote about in his book All My Best Friends, including Al Jolson, Groucho Marx, and Jack Benny. Burns, who lived to be 100, had Carson laughing as he joked about outliving his doctors and his habit of smoking between 15 and 20 cigars every day.